SO WINDY!!! You guys, hahah I have every intention of re-blogging these nautical sailor pants when I can actually stand so you can see them but with the wind, it was just impossible. I honestly can’t look at these pictures without laughing because it really was such a struggle. It felt like I was going to get blown off the pier! 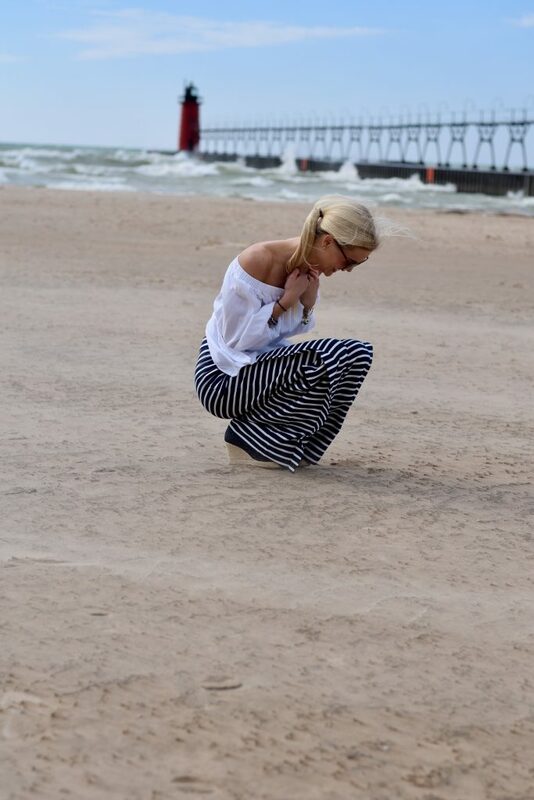 To give you an idea of the strength of the wind, I couldn’t even set my purse down because the wind would have actually taken it right into the lake! Words will never do this little adventure justice but take my word, it was cold and the wind was strong. I had sand in my teeth and hair for the remainder of the day and my car looked like a beach just from opening up the doors and climbing in. In some ways the pelting of the sand was painful, in every way it was worth it. This was a blogging adventure for the books, that’s for certain! A huge shout out to my friend, photographer and creative partner Serena, for laughing with me until our abs hurt. Switching topics, I attended a super inspiring church service last Sunday and would love to share a bit about it with you all. I didn’t take “notes” and quite honestly wouldn’t be able to recap it for you all that well, however, I can tell you the take away I left with that is still stirring in my heart. Have you ever felt like you’ve been called to do something but let your fears and doubts hold you back? That’s where I’m at right now. The service I attended was about being obedient. Obeying God, leaving your comfort zone and taking on new endeavors can also be said in as few as two words. God has called us to be Fearless Followers, obeying the plans He has for us. I left feeling called to take that next step that He has put on my heart with the validation that although being obedient can be scary He won’t let me fall. I’m ready to obey, I’m ready to take a leap of faith, I’m ready to be a Fearless Follower. I promise that with obedience comes great joy. Have you been called to do something lately that you’ve been fighting at the risk of the discomfort it might cause? Something to think about this weekend!